We all know it’s important to think of our users first, and that user feedback is important; however all of us have to deal with products, processes and systems in our day-to-day lives in which the user was likely at the bottom of a long list of other priorities during the design phase. Anyone who has been through customs in an American international airport as a non-US citizen can understand what I’m talking about. In Beijing International Airport, however, they appear to value feedback from travelers. Attached to the booth under the window on every customs desk is a small box with 4 buttons. 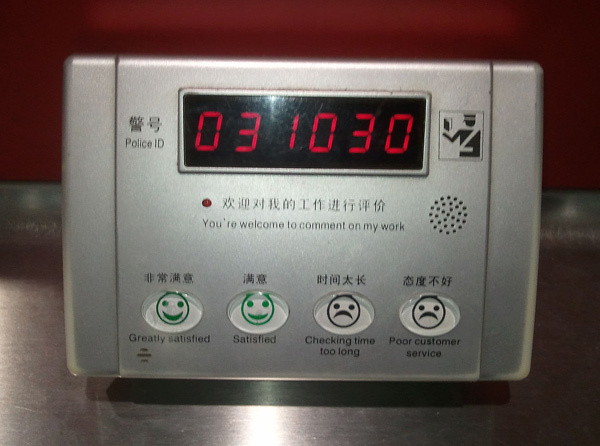 The text above the buttons reads: “You are welcome to comment on my work”, and you’ve invited to press “Greatly satisfied”, “Satisfied”, “Checking time too long” or “Poor customer service”. In full transparency the custom officer’s identification number is shown directly on the display. It would be interesting to know what they do with the results: whether they use the outcome to performance manage the staff member, or to identify patterns of satisfaction across different demographics of traveler. Either way, it’s refreshing to see an area that appears to be traditionally nonchalant about user satisfaction take an interest in what people think for the purpose of making the system better. This entry was posted in Agile, Product Design, Product Management and tagged airport, beijing, customer feedback, user feedback. Bookmark the permalink.